Easy pesto recipe has only sweet basil, a cheese and olive oil as the base. 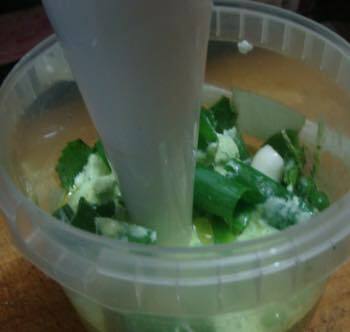 Easy pesto recipe has only sweet basil, a cheese and olive oil as the base ingredients. For the authentic dish you'd use Parmesan and lightly toasted pine nuts, but hey, this is just a way of improving the flavour of what might otherwise be a rather dull green salad. 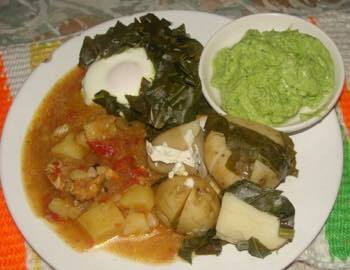 Tonight we're enjoying it with dinner instead; new potatoes, a poached egg on steamed kale and chicken stew. Researchers keep finding the absolute necessity of the myriad of phytochemicals in our food; for example, if you don't get enough lutein, you're probably going to get cataracts or age onset macular degeneration. But one simply can't go though each day worrying whether we have had enough lutein, beta carotene, or betaine; yet these are absolutely vital chemicals that our bodies demand daily, or we pay the ultimate price. You either get neurotic about what you eat, or you can enjoy dipping into a wide range of foods such as this easy pesto recipe. Then you can be assured of plenty of phytochemicals in your dinner. Simply the anti inflammatory oleocanthal in your extra virgin olive oil, and the eugenol in sweet basil that gives proven protection against osteoporosis make this something rather more than just a wonderful condiment to go with your green salad. Then there's the allicin in your spring onion and the garlic clove with proven anti cancer protection, and the vegetable protein in your green peas to reduce your reliance on red meat for amino acids. Then there's the limonin and vitamin C in your lemon, do use the whole pulp and not just the juice, by the way; it has proven protection against breast, mouth and colon cancer. In short, your easy pesto recipe is a medicine chest of protection against a host of nasty illnesses. Enjoy these kinds of foods and you'll sleep a lot easier at night when all around you friends and neighbours are succumbing to arthritis, cancer and a multiplicity of auto immune diseases. Easy pesto recipe then could include other herbs, spring onions, green peas or anything else that suits your fancy. Don't make too much; without chemical preservatives, it won't keep. Plan to finish it within three days. If you're a baker, then tip the surplus into your dough; it serves to lower the glycemic index, or GI. 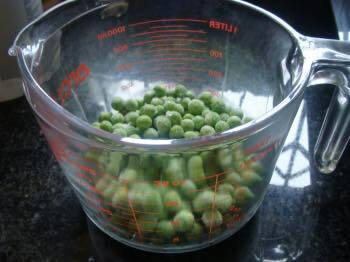 One and a half cups of fresh or frozen peas. 50 g chunk of feta. A clove of garlic, perhaps two. Handful of sweet basil leaves. One or two spring onions or a bunch of chives. Half a lemon or lime, pulp and juice. Normally we have a mass of fresh green peas through the winter and early summer, but as I write it's far too hot; frozen foods do have a place on the menu, though the flavour is very second rate. How to grow peas isn't rocket science but they are only for the larger veggie garden. 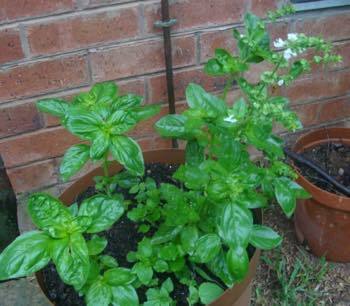 Sweet basil is my all time favourite herb; just to walk through the garden and crush a few leaves between the fingers releases the most divine fragrance; the bees love the flowers too. It's best grown under the eves like this, protected from the rain; they are inclined to get blight. 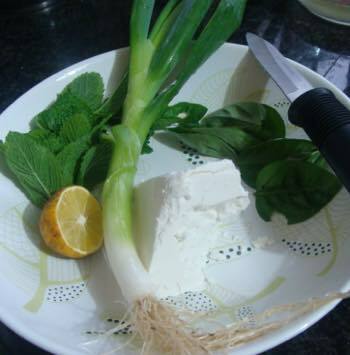 Mint, sweet basil, a shallot and of course half a lime; and the Feta cheese. I have a photo of mint, a must for every garden, but I blurred it. I know nothing of the nutritional virtues of the herb, but I'm sure they are interesting; it tastes great in any case. Ah, World's Healthiest Foods, tell me that peppermint is the solution to an angry colon. The old adage, when first moving into a new home, first plant a lime or lemon, or better still both, is even more valid today that centuries ago when first coined; that out of a bottle is absolutely ghastly; don't touch it. Growing lemon trees is not rocket science. You can rustle up this easy pesto recipe in less than ten minutes, once you've assembled the ingredients. Obviously if you're are picking green peas from the garden, then shelling them can take an extra twenty minutes; that's where we call in the troops. There is an amazing synergy of energy and ideas when you share a home with family. This is where the grandchildren cut their teeth on backyard permaculture. Briefly blanche the fresh or frozen peas in a little boiling water. If raw garlic gives you heartburn then drop the clove into the boiling water with the peas for perhaps a minute. Add all the ingredients into a plastic container and blend until smooth; if it's too stiff, add a little water. Add some sea salt and black pepper to taste, though there should be plenty in the feta. I'm sure the mint has other phytochemicals that, at this stage I don't know about; no matter, we just enjoy the rich flavour of these herbs. You don't have to understand the inner workings of a compute to use it. Normally we would use an easy pest recipe such as this with a salad, but tonight I'm going to experiment with using it as a side dish to go with new potatoes, steamed kale onto which I've dropped a free range egg. If I'm still hungry then a half a slice of our sourdough bread and butter will fill the last gap, spread with a little easy pesto; we only enjoy desserts on high and holy days; mind you homemade icecream and a mulberry sauce titivates the tongue quite beyond reason. Don't we all love sugar, but the desire definitely needs to be curbed; empty calories that immediately packs on the pounds; but enjoyed in the context of a meal like this, we need have no concern with a little glycemic carbohydrate. In fact the new potatoes are in the same category. 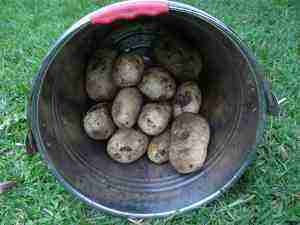 Incidentally, until you've experienced vegetables straight from the garden, you have no idea what good food really tastes like; potatoes it's generally acknowledged have a high glycemic index. I wonder if there is a difference between those harvested weeks ago, and those dug out the ground only half an hour ago? It wouldn't surprise me. It comes as quite a surprise how firm they are, with absolutely no need to peel. The more authentic pesto recipe is made with pine nuts and Parmesan cheese. It's equally good, rather different and to the purist the real McCoy; they would sneer at our easy pesto recipe! Try our genuine recipe basil pesto. Eugenol is the phytochemical in sweet basil and cloves that gives them a divine frangrance; more important perhaps is the proven anti inflammatory effect, making this easy pesto recipe a naturally desirable functional food; those that help prevent disease and promote health. Read more about it at herbs eugenol oil. Oleocanthal is another of these phytochemicals with a proven anti inflammatory effect on the joints and muscles of the body; it's found only in extra virgin olive oil; the refined sort has none. So this easy pesto recipe gives you a double protection against angry, red, painful tissues. Enjoyed every day, it's much safer than anti inflammatory drugs. Why all this on food on a chiropractic website, you may be asking? The best health care for your joints and muscles will be less effective if you are eating a highly inflammatory diet. This easy pesto recipe, enjoyed regularly will certainly make a difference to the anger your body may be expressing.